The Iranian oil tanker Sanchi collided over a week ago with a freighter, and Chinese officials say the oil slick is now 128 square miles, threatening marine life, including humpback and grey whales. 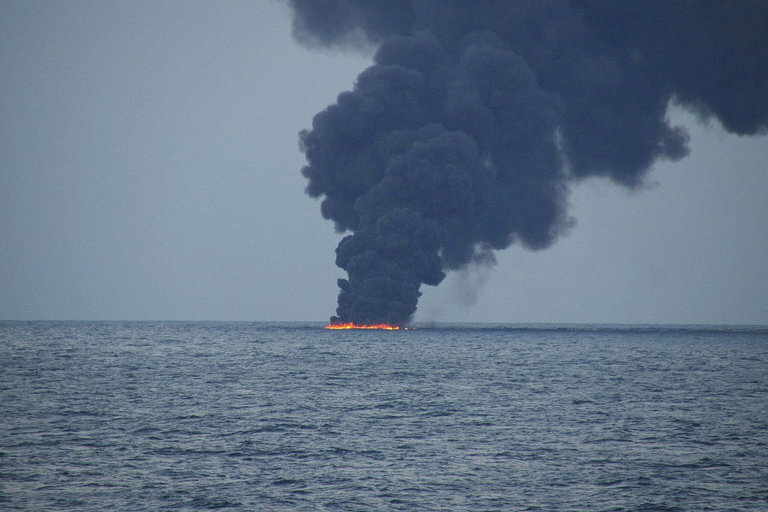 The spill from a sunken Iranian tanker off China's east coast has more than tripled in size, just over a week after the ship sank in a ball of flames. Authorities spotted three oil slicks with a total surface area of 332 square kilometers (128 square miles), compared to 101 square kilometers reported on Wednesday, the State Oceanic Administration said in a statement late Sunday. The Sanchi, which was carrying 111,000 metric tons of light crude oil from Iran, collided with Hong Kong-registered bulk freighter the CF Crystal in early January, setting off a desperate race by authorities to search for survivors and stave off a massive environmental catastrophe. The amount was revised down from the original estimate of 136,000 metric tons, the Ministry of Transportation said Friday. Wang Junding, a Chinese fisherman, told AFP that the spill is unlikely to have much effect on his industry, since "there aren't many fish there to begin with." In addition to the light crude oil, the Sanchi also carried a fuel tank able to accommodate some 1,000 metric tons of heavy diesel. By comparison, in the eighth-worst oil spill since the 1960s, the Sea Star dumped 115,000 metric tons in the Gulf of Oman in 1972, according to figures from the International Tanker Owners Pollution Federation website. - Atlantic Empress and Aegean Captain, 1979: The two Greek-registered tankers collided and caught fire off Tobago in the West Indies, spilling an estimated 287,000 metric tons of crude. Thirty sailors died. - ABT Summer, 1991: Loaded with 260,000 metric tons of crude, the Liberian-registered tanker exploded some 1,300 kilometers (900 miles) off the coast of Angola. The ship burned for three days before sinking with its cargo. - Castillo de Bellver, 1983: The Spanish oil tanker ran aground off Saldanha Bay in South Africa, spilling 250,000 metric tons of oil. - Amoco Cadiz, 1978: 227,000 metric tons of oil washed up on 400 kilometers of French coastline when the Liberian-registered supertanker sinks off Brittany. - Haven, 1991: The Cypriot oil tanker sank off Italy's Gulf of Genoa after fires destroy most of its 144,000-metric-ton cargo. The remainder of the oil formed a slick, polluting Italy's Liguria coast and Provence in France. - The Odyssey, 1988: The British ship carrying 132,000 metric tons of oil sank with its 27-member crew in the Atlantic, 1,300 kilometers from the Canadian coast. - Torrey Canyon, 1967: 121,000 metric tons of oil polluted the coast off England and France after the grounding of the Liberian-registered supertanker. Other oil tanker shipwrecks may have involved less oil but still caused major environmental damage. These include the Exxon Valdez in Alaska in 1989, the Sea Empress off Wales in 1996, the Erika in France in 1999, and the Prestige in Spain 2002. - Gulf of Mexico, 1979: Around one million metric tons of oil gush from the Ixtoc-Uno well after an explosion on a rig operated by Mexican state oil company Pemex. Capping the leak took nine months. - Gulf War, 1991: Around one million metric tons is estimated to have spilled when Iraqi forces set fire to Kuwaiti oil wells. Hundreds of kilometers of coastline are polluted. - United States, 2010: The explosion of the Deepwater Horizon oil rig, operated by BP in the Gulf of Mexico, left 11 dead and the spillage of more than 600,000 metric tons of oil.